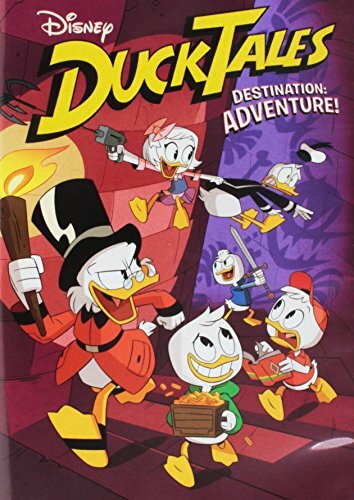 DVD Review: DuckTales: Destination Adventure! My wife and I really liked the DuckTales cartoon back when we were kids, and we very happy to find that we also enjoyed the 2017 updated series when it premiered almost a year ago. It's full of action, adventure and comedy, and unlike the original show the nephews Huey, Dewey, and Louie each have unique personalities and aren't just interchangeable. Also, the character of Webby has been given a much needed update, making her brave, smart, and on equal terms with the nephews. I hated her character in the original series as she was very timid and talked in a super annoying baby voice. I think those were good picks. The The Beagle Birthday Massacre! episode isn't as much of an adventure as other episodes but it really explores, defines, and cements the relationship between Webby and the boys. The Living Mummies of Toth-Ra! is a funny mummy mystery that takes place in a giant pyramid (Webby and Louie), The Impossible Summit of Mt. Neverrest! is a trek to the summit of a dangerous mountain, The Spear of Selene! finds the group on an island of ancient greek gods where we get to find out a little more about Della Duck, Huey, Dewey, and Louie's mom (Webby and Dewey). In The Missing Links of Moorshire! McDuck squares off against his longtime rival, Glomgold, in a golf tournament and the entire group accidentally gets teleported to some kind of magical golf course. Last is my favorite of the included episodes, Beware the B․U․D․D․Y․ System! . It starts with Dewey watching an episode of Darkwing Duck, another cartoon I used to love back in early nineties. The in-show cartoon had the same updated look as this show, and it even sounded like they got the original voice for Darkwing, Jim Cummings. The story is about Lauchpad trying to prove that he's a better driver than a robot by racing against not an automated car, but a robot driving a car. Lauchpad (who has a Darkwing Duck bobblehead on his dash that says the catchphrase "Let's get dangerous!" when its head is tapped) doesn't win but shows his worth in another way. And one of my favorite characters from the original series shows up at the end, but I won't spoil that surprise! The New Gizmo-Kids on the Block episode has the nephews and Webby donning a shrunken down Gizmoduck suit while Ducky Mountain High finds Scrooge McDuck meeting up with old rival/love interest, Goldie. This is a good collection of episodes until we can get a full season release, especially as it's only $9.99. An ancient tomb in Toth-Ra, the mountain peak of Mt. Neverrest, a vacation island for Greek gods…global expeditions await! Thanks to Huey, Dewey, Louie and Webby, trillionaire Scrooge McDuck is back in action, leading the way to death-defying exploits stretching all the way from Duckburg to legendary destinations around the world. Let the greatest family adventures begin! Bring home the fun on Disney DVD June 5th!